The Midwest League, a Class-A minor league baseball league that hosts 16 affiliate teams for Major League Baseball organizations, has showcased a number of talented prospects this season. Amongst those prospects include the likes of two top-ten overall draft picks from the 2012 First-Year Player Draft, all of whom have established themselves as the top performers of the league in their first full seasons in professional baseball. The prospects in question are the Kane County Cougars‘ Albert Almora (Chicago Cubs) and Cedar Rapids Kernels‘ Byron Buxton (Minnesota Twins). Both are still teenagers and according to MLB.com’s 2013 Top 100 Prospects, were amongst the top prospects coming into the season (Buxton-18th and Almora-37th). 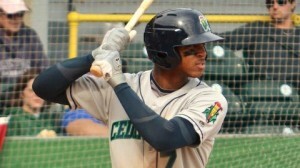 The second-overall pick in last year’s draft out of Appling County High School in Georgia, Byron Buxton has dominated the Midwest League this season, separating himself from the rest of the competition (and to an extent, even from the talented offensive exploits of Almora and Correa). Buxton has either ranked at the top or near it in almost all significant offensive categories this season, suggesting to many that he is clearly at a higher skill level than his competition in the league. In 61 games this season, Buxton is batting .343 (82-for-285) with eight home runs and 50 RBI, along with 27 stolen bases and an OBP/SLG/OPS line of .433/.573/1.006. Drafted by the Twins for his complete, toolsy game, Buxton has been everything and then some for Minnesota this season at Cedar Rapids. Buxton is five-tool player that consistently uses his plus tools on the field, which are highlighted by his tremendous speed, incredible bat speed, and innate hitting ability. As for Albert Almora, the word impressive comes to mind, much like it has for Buxton this season. The sixth-overall pick in last year’s draft out of Mater Academy Charter School in Florida, Almora has put on an offensive clinic for Kane County since his mid-May return from surgery to repair a broken harnate bone in his hand, which he suffered during minor league spring training. In 19 games this season for the Cougars, Almora is batting a scorching .430 (34-for-79) with one home run and 11 RBI, along with an impressive OBP/SLG/OPS line of .465/.595/1.060. Although a lot of attention was given to Buxton in last year’s draft season, Almora followed in close pursuit, showcasing a toolsy skill-set on par with that of Buxton. An USA Baseball alum, Almora possesses one of, if not the best center field glove in the minors, showcasing a strong arm and great range. Almora has plus instincts at the plate, boasting exceptional hitting ability to all fields and the potential to develop solid pop in his bat. 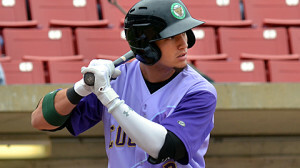 Almora is an advanced and seasoned ball player who has the innate approach and skill set to succeed at the next level. Due to such, he should move quickly throughout the Cubs organization, which is becoming a more realized truth as he continues to shred Midwest League pitching. Almora and Buxton have both put on a show in the Midwest League this season, a competitive Class-A minor league that includes the likes of first-overall pick Carlos Correa (who owns a .291 batting average in 52 games). Evident is the fact that both top prospects possess skill sets that separate them from the rest of the field, wherein it is not hard to believe that both should not last much longer in the Midwest before moving up the ladder in their respective organizations.